White Boy Rick is a solid effort that introduces Merritt and reminds us why we love McConaughey and the fact that it is based on a true story makes it all the more interesting in my opinion. Richard Wershe Jr. (newcomer Richie Merritt) was born on July 1969 but never stood a chance at having a normal life. He lived in Detroit, Michigan with his father, who sold guns illegally, and his drug addict sister. At fourteen years old he became the youngest ever FBI informant but was abandoned when three years alter he was arrested for selling drugs on his own. He was sentenced to life in prison and spent 30 years behind bars. Making its premiere at the Telluride film festival in August 2018, the film White Boy Rick details his life from the age of fourteen to seventeen. Richard Wershe Sr. (Matthew McConaughey; Dallas Buyers Club) was a two-bit hustle who enlisted the help of his son Rick, Jr. to help him sell illegal firearms and silencers mostly to the drug dealers of Detroit in the 1980s. Constantly harassed but the FBI he always told them to leave him alone which they did. However, they did approach Rick, Jr. with a promise to keep his father out of jail if he helped them. At fourteen "White Boy Rick" was buying and selling drugs under the direction of the FBI and the Detroit Police Department. He was also their youngest informant ever. A year later he was shot and his tenures with the FBI ended. With little money coming in Rick, Jr. convinced his father to let himself drugs since he already knew how to do it, thanks to the FBI. For a while, it was profitable until he was arrested. Once again the FBI came into play, willing to assist with Rick, Jr.'s sentencing. However, when the day came there was no leniency and White Boy Rick went to jail for the next thirty years. Meanwhile, the other Detroit drug dealers earned lesser sentences along with the dirty cops who were on the take. White Boy Rick is simply another example of how justice isn't always served in this country. Richie Merritt was plucked out of a Baltimore school and given acting lessons to play this part and, for his first acting role he did a pretty good job. He has that "swagger" of a drug dealing black man while capturing a little bit of childlike innocence. McConaughey is the real star though, stealing every scene he is in. He leaves no question as to why he won an Oscar. Jennifer Jason Leigh (The Hateful Eight) as FBI agent Snyder is also captivating on screen playing the "good cop" to Bryan Tyree Henry (Hotel Artemis) and Rory Cochrane's (Argo) bad cops. While the script starts off strong it loses steam by the third act and everything at that point seems to become anticlimactic. The film probably should have ended after Rick, Jr. gets shot as the momentum slows considerably but unfortunately that wouldn't have told his whole story so the film plugs on at a snail's pace. Director Yan Demange ('71) is known more for television than film and maybe that is part of the issue. Or perhaps it is simply that the third part of the film isn't as interesting as the initial buildup and the meat of the story as Rick, Jr. gets sucked into the thick of it all. The Blu-ray has one disc and the digital download plus a few extras. If you are interested in the real-life details behind the film then the extras will be particularly interesting to you. The 1080p video quality is your standard fare but showcases the costumes particularly well. The DST-HD Master Audio 7.1 is pretty strong and enhances the 1908's soundtrack. Download White Boy Rick from the iTunes Store in Digial HD. 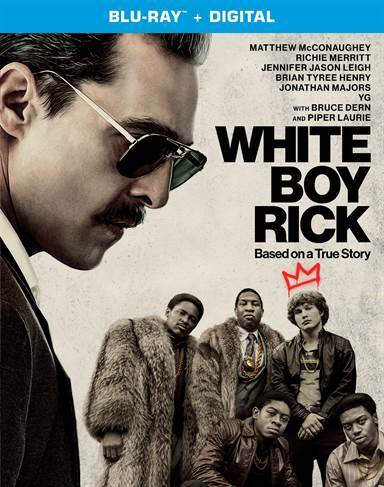 For more information about White Boy Rick visit the FlickDirect Movie Database.